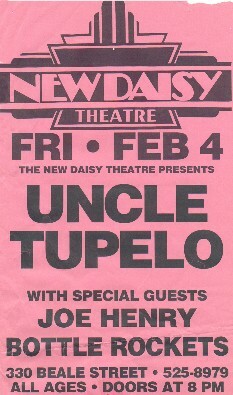 Joe Henry opened all of the shows on the 1994 tour up through 3/23/94. His band included Jim Boquist and Eric Heywood, both of whom later joined Jay Farrar in his band Son Volt. There is no known audio of this show. Here's a lengthy preview and interview with Jeff from the Orlando Sentinel, and here is a review. Creamsickle opened. Here's a preview and interview with Jay from the Tallahassee Democrat. Audience recording. 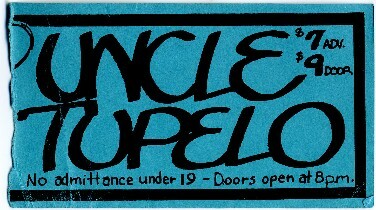 From the Charlotte Observer on 2/11/94: "Uncle Tupelo: It sounds like a cliche, but Uncle Tupelo's life as a band is only just beginning. Its first two albums were rocket shots of punk guitar fury mixed with a twang - Husker Du fronted by Hank Williams, as one writer put it. Its third LP was an all-acoustic affair of original and standard country-blues and folk tunes. Its latest (''Anodyne'' on Sire Records) is a magnificent, mature mix of both. With Joe Henry. Tuesday at the Pterodactyl Club." Here is a longer preview and interview with Jay, also from the Charlotte Observer. Audience recording. Jeff, Jay, and Ken did an interview (no musical performance) in the afternoon on the local college station, WXYC. Dish was also on the bill. TV broadcast. 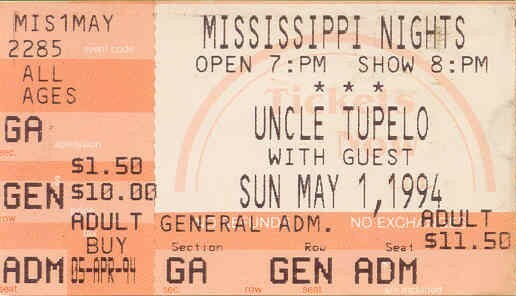 Uncle Tupelo's first, and last, national television appearance. Here's a brief "preview of this appearance" from the Riverfront Times. Audience recording. A review from the Philadelphia Inquirer. A preview of the show from the Times-Union. Set included "Effigy" and "Whiskey Bottle." A review from the Hartford Courant. Audience recording. A preview from the Pittsburgh Post-Gazette. Audience recording. Here's an interesting preview of the Minneapolis shows from the St. Paul Pioneer Press. Audience recording. Gary Louris from the Jayhawks joined the band for the last three songs. Preview from the Star Tribune: "If Neil Young fronted R.E.M. (now there's a grand idea! 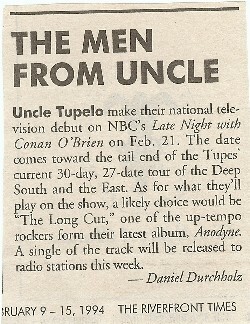 ), it might sound a bit like Uncle Tupelo. This trio may be from St. Louis (actually from Belleville, Ill., which is 30 miles away), but the Tupelos have always been cowpunks. Their fourth and latest album, "Anodyne," is vintage country in emotion and content, played with rock 'n' roll spirit and guitars, smartly produced by Minneapolis' own Brian Paulson. 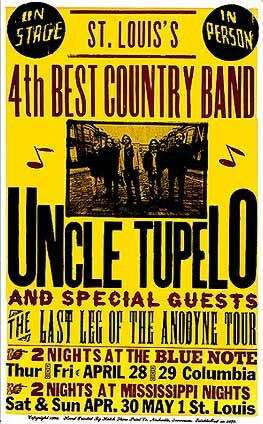 Uncle Tupelo has been a favorite at First Avenue for the past few years. The group will conclude its two-night stand there with a performance tonight open to people of all ages." Audience recording. A review from the Milwaukee Journal. Audience recording. Last show with Joe Henry opening, and he joined UT for two songs. Here is a review from the Chicago Sun Times. Audience recording. The last of many great shows at Lounge Ax. The Handsome Family opened. FM broadcast. This is part of the same show listed above. Chicago radio station WXRT recorded it and broadcast part of it a few months later, and then again in early '96. The DJ on the original broadcast incorrectly said the show was recorded in 1993. With the Bottle Rockets and Marques Bovre & the Evil Twins. Here is a preview from the Madison State Journal. The Bottle Rockets opened. 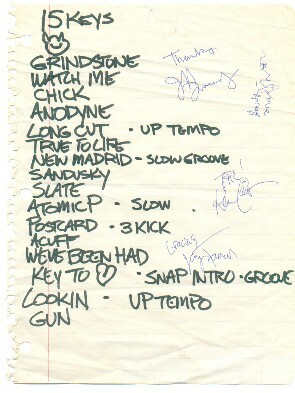 The set included "Gimme Three Steps" with Brian Henneman on vocals. Audience recording. This was on outdoor show on the college campus. Audience recording. 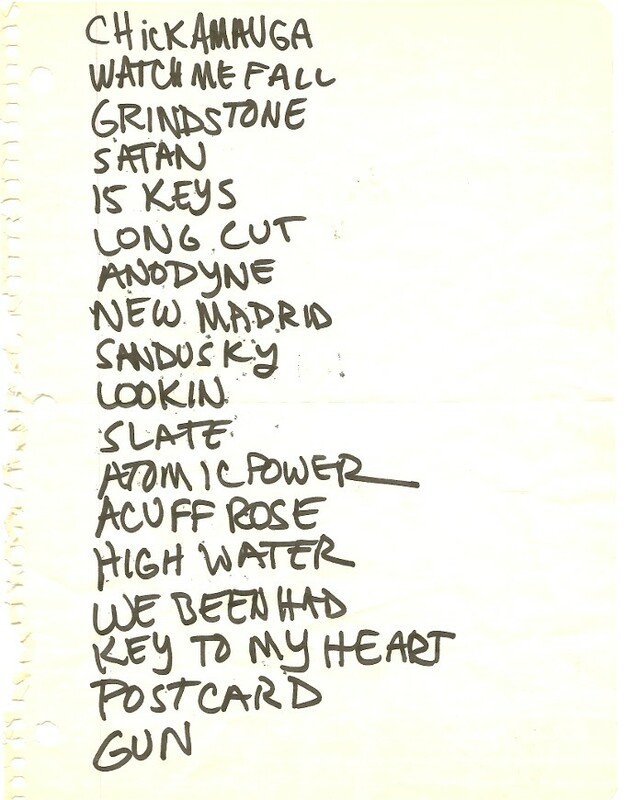 "Moonshiner" was very rare on this tour, and this is the last known version of the song. Approximately 30 people in attendance (thanks to Jeff P and Bro for the information). Note that an earlier listing of a radio interview before the show was incorrect. With Matthew Sweet and Spanic Boys. Audience recording. Openers were Blue Mountain and the Bottle Rockets, who played acoustic. 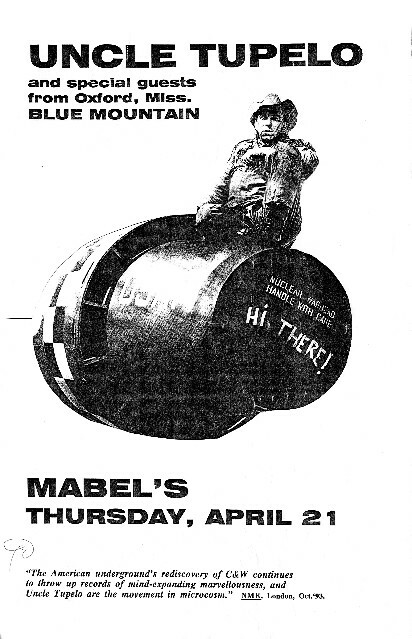 The Bottle Rockets debuted much of The Brooklyn Side at this show. Soundboard recording and multiple audience recordings. 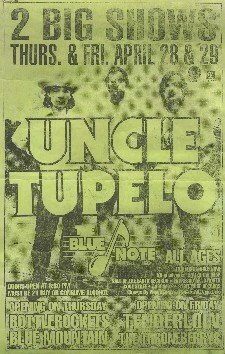 The last of many great shows at the Blue Note. Throneberry and Tenderloin opened. Soundboard recording and multiple audience recordings, as well as excellent quality video footage filmed with a tripod (click on the hyperlinks above to watch clips on Youtube). Soundboard recording and multiple audience recordings, as well as at least two different videos (click on the hyperlinks above to watch clips on Youtube). 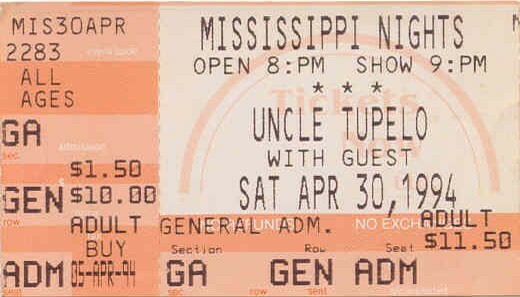 Uncle Tupelo's last show. Mike Heidorn joined the band for the first time in two years for "Looking For a Way Out." The Bottle Rockets opened, with special guest Syd Straw on a few songs. 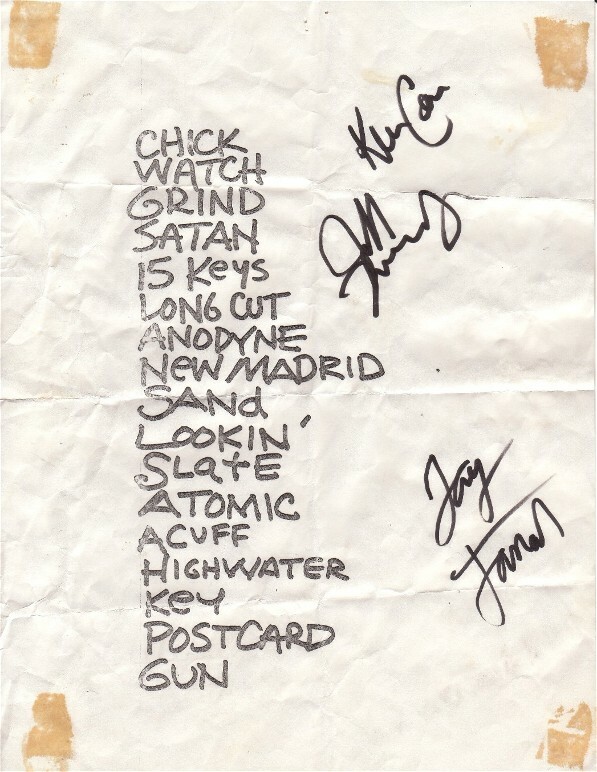 Jeff Tweedy's setlist from this show. 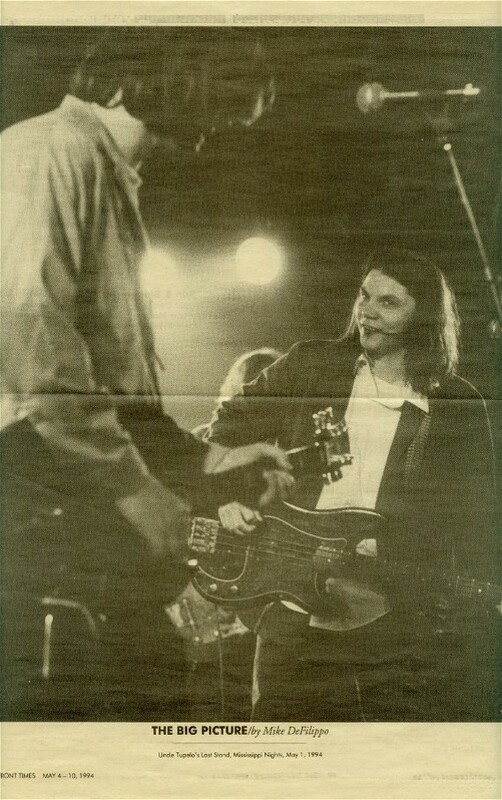 A picture from this show from the Riverfront Times.